Guest blog post written by Cayla Cluckey who is currently attending Ithaca College for her Bachelor’s degree in Social Studies Education. Cayla is spending her final semester student teaching at a secondary school (grade 10) in Ithaca, NY. 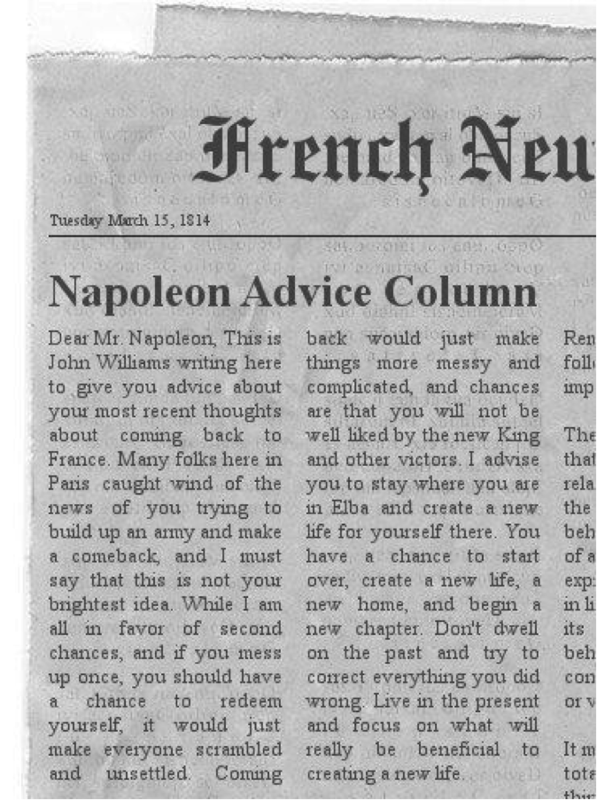 I’d like to share with you a practical means for using Fodey, a newspaper-clipping generator, in the classroom. I was first introduced to this website via the “Not Another History Teacher” blog. Fodey is such a great way to get students engaged while writing. If you are looking for technological ways to enhance the learning and writing process, this site is for you! 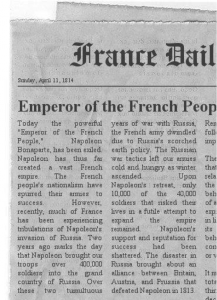 My tenth grade global students are currently studying the Age of Napoleon. I used Fodey as a creative wrap up assignment for the unit. Students were apprehensive at first about the work but found the activity to be both informative and engaging. I gave students four genres for their newspaper articles. 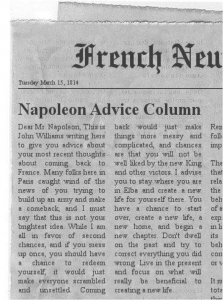 They could choose to write an editorial from the perspective of one of Napoleon’s soldiers, a headline event during the Age of Napoleon, an obituary addressing the legacy of Napoleon, or an advice column written to Napoleon. Such choices get student’s thinking critically about the past and incorporate common core writing into daily instruction. I found this project to be successful because students had the opportunity to chose the content material they found most note worthy, and the section of the newspaper in which they could best convey their thoughts. 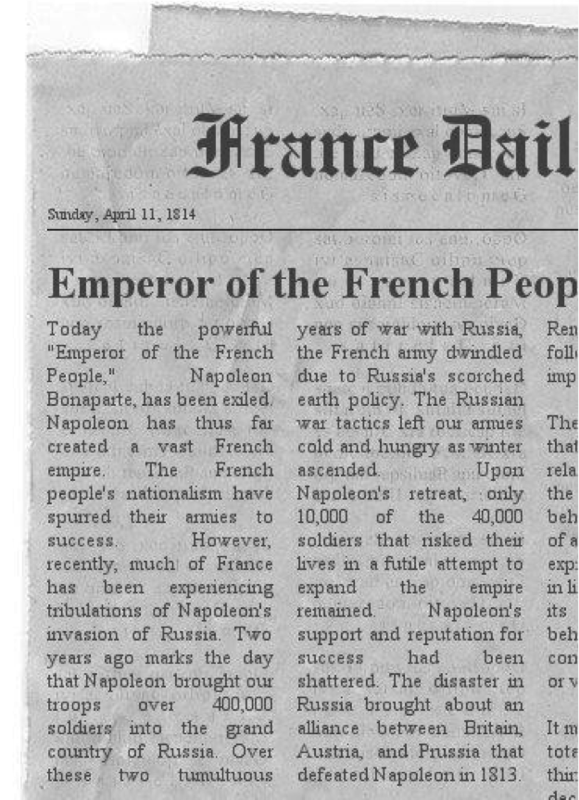 Using Fodey was powerful in that students felt as though they were actual publishers of a newspaper during Napoleon’s time period. Fodey can be used as a means to make history come alive! Not only that, but it is easily accessible for all students; it’s just two simple steps: type, generate, and voila…as Napoleon might say! Words of caution: Fodey cut off some of the students who wrote lengthy articles. To fix the situation, I had the students submit the text to the article along with the picture of the clipping. I’d like to share relatively simple idea that makes use of Google Drawing to annotate maps. This is great for historical maps because it’s easier to do than overlaying a map onto Google Earth. If you don’t know about Google Drawing, you can find it in Google Drive. Instead of creating a Google Doc, just go a bit further down the drop-down menu and select “Drawing”. Then, when you are in the drawing window, “Insert” an image and resize the image and the canvas to your liking.After that, you and the students can use the line tool and scribble tool to draw on the map, use the text tool to write on the map, and use the insert image function to include other images. 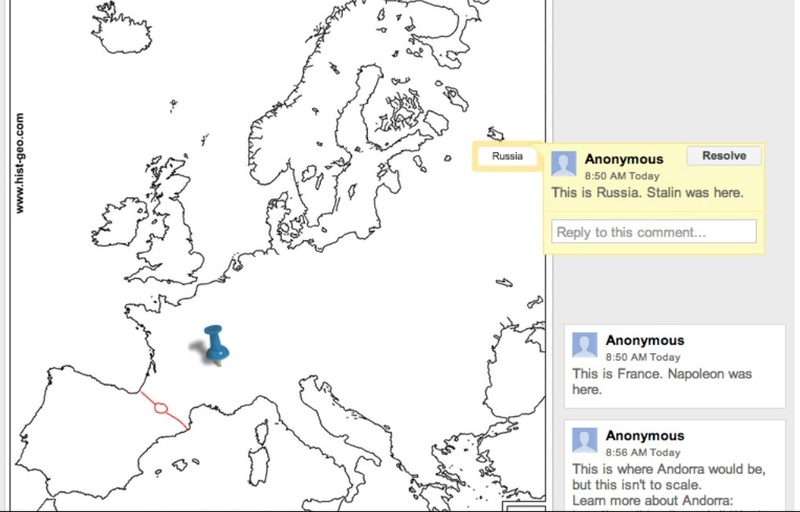 If you right-click on the lines, text, or images, you can select “comment” to add a comment to the right of the map. Move your mouse over the comment to see which part of the map it pertains to, or click on an element of the map to see which comment is associated with it. Best of all, because this is a part of Google Drive, multiple students can collaborate on it. It may be worthwhile having students annotate a map before you teach them the lesson. As a form of pre-assessment, they could annotate it with what they know. Then, as the lesson goes on, they could revise their previous annotations or drawings to show what they’ve learned. Depending on your purpose and the students’ ages, you may also want to have some small pushpin images or premade labels down the side so that the students have only to drag them into place. One of my New Year’s Resolutions is to teach completely using the iPad. The only exception is when I show a DVD in my classroom. So far it has been fairly easy since I got this wonderful Longitech keyboard, which makes typing so much easier. In my classroom I have an Apple TV, which allows me to mirror anything from my iPad or my student’s iPad to the projector. I am always looking for new ways to make my iPad more efficient and save me time. I recently discovered Gooru, which any user can use on their mobile device or on a regular computer browser. Gooru Collections allow any user to have access to more than 3,000 educational materials. The website is organized into playlists and is designed for every 5th-12th grade student.The options are endless from videos to games, to digital textbooks, useful teacher approved websites, quizzes, and so much more. Collections are aligned to standards and currently cover every 5th-12th grade math, science and social science topic, with more subjects coming soon. One of my favorite features is that you can save any resource to your username so anytime you want to access a particular resource it’s right on the home screen or “shelf.” The best part is that it’s FREE and has NO advertisements. Check it out today, you will not be disappointed! Learning Objective: Students will demonstrate an understanding of social science methods of investigation through interviewing a family member on their memories of 9-11. Students will analyze and discuss the interview through writing a blog post. The first part of your assignment is to interview someone who was old enough to really understand the impact September 11th had on America. Please ask them the following questions and record their answers, either by writing or recording (video or audio). It is your choice to document the interview through video or voice recording (your smart phone or computer can easily do that) if that is easier for you. 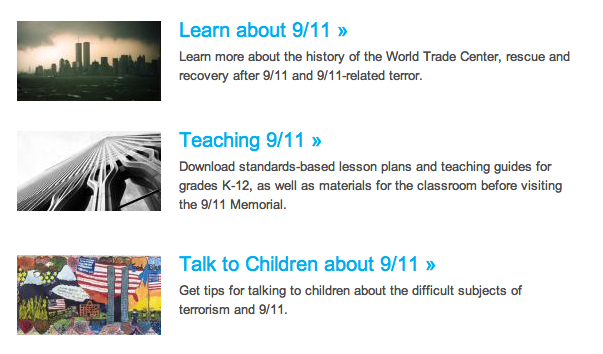 Step 1: In your first paragraph create a summary of your family member or friend’s recollection of the events of 9/11. Your purpose here is to share their remembrances as truly as possible to reality- you should use both quotations and summaries in your own words. Make sure that you put quotes in “ “ marks and that you identify your source using only first name. Step 2: In your second paragraph, explain why you think 9/11 has changed the world we live in today and how America has changed as a result of the events of this day. You may use the first person (I, You, we, my) in this section. Step 3: Proof-read your document and make sure everything is correctly spelled. Read your paragraphs out loud to yourself to make sure the grammar and flow are well edited. If you have any pictures to share, please post them in the email. 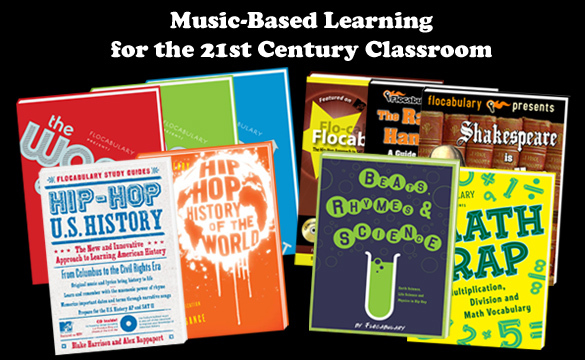 I learned about History for Music Lovers by @magisterWarren. History for Music Lovers was created by Amy Burvall and Herb Mahelona. The videos on Amy and Herb’s YouTube channel – historyteachers – have been uploaded over 3.5 million times. They created the videos with the the purpose of making their curriculum fun, engaging, and educational for their students. They have around 50 plus music videos on world history topics. The videos are educational and they are catchy. The learning process becomes an enriching experience when you combine their passion for history and music. Who are Herb and Amy? Amy is a 19 year Humanities teacher and is a a leader in educational technology. Her work in the History for Music Lovers project has appeared in Wired magazine, The Washington Post, The New Yorker, CBC, NPR, international blogs and media. Herb has been a classroom educator for twenty years. He is a composer, arranger, musician, web designer, and filmmaker. Here is Amy Burvall’s Own Official Web Page (c/w Biography, etc. ): http://www.amyburvall.com/#! Here is one young lady who was inspired by them to make her own videos: http://www.youtube.com/user/sarahjoygordonpdx She sings some really cool history parodies. 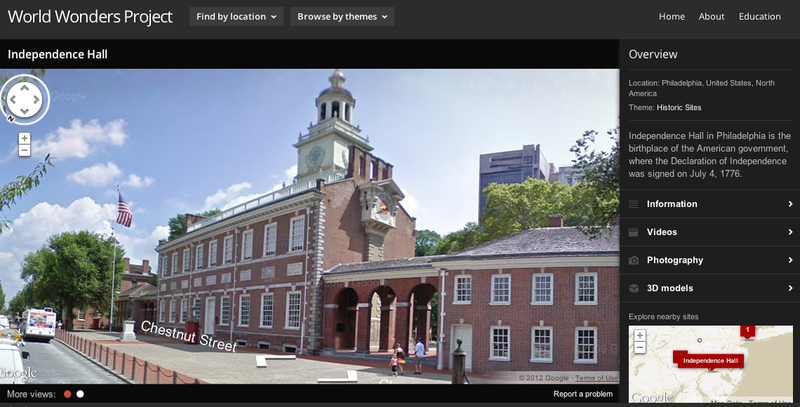 I learned about iWitness from @ghkcole from #sschat. IWitness is a website for teachers and students that has over 1,000 Holocaust video testimonials of survivors and witnesses. This collection is just a small part of the collection maintained by the University of Southern California’s Shoah Foundation Institute, established in 1994 by Steven Spielberg. This is a wonderful resource for schools teaching about the Holocaust. According to iWitness, “Students have the opportunity to use technology to become more active learners while encountering survivors and other eyewitnesses talking about their experiences before, during and after the Holocaust. This application empowers them to participate in their own learning by providing them with the tools to think critically, investigate, develop projects, analyze, and collaborate with others.” I plan on having my students go to the website and do a personal history search a couple nights before I teach about the Holocaust. Students will then come in to discuss, share, and reflect on what they learned about the Holocaust. You can watch a short video demonstration of IWitness here. Flocabulary: Much More than Just a Song! I am always amazed when I talk with social studies teachers who have never heard of Flocabulary. 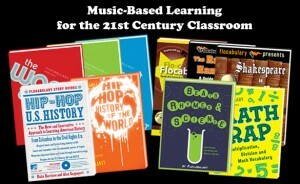 Flocabulary creates hip-hop music and materials to supplement your curriculum. The first time I ever played a US history Flocabulary song my college roommate came in dancing…. little did she know it was about “who discovered it” related to Christopher Columbus. I use everyone of the US history songs as a unit preview. I actually made a powerpoint of images and typed the lyrics to go along with the Flocabulary songs. Through the rap songs we discuss key vocabulary and concepts we will learn with the upcoming unit. Even though Flocabulary is no longer free, it is well worth the money to subscribe to its wonderful features! Another reason I love to use Flocabulary in the classroom is the Week in Rap. Every week on Friday mornings, Flocabulary puts together the week’s biggest or most interesting current event stories into a rap music video. 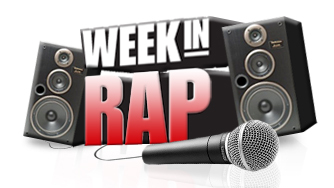 The week in rap discusses the hottest topics of the week, such as the Travon Martin case, the oil spill, crisis in Syria to name a few. My 8th grade students in White Plains, NY loved the Week in Rap. They actually asked to watch it every week. I was even surprised that after spring break, they asked if they could watch it from the week before! The best part about the week in rap is not just the music, even though it is good, they love discussing the current events. Yes, you read that right! They love discussing the current events. After I play the week in rap, I ask them if there is anything they want to discuss. Around 18 hands in my classroom instantaneously shoot up. I am often not leading the discussion, but facilitating it. Students respond by saying “oh I heard that on the news,” “my mom was talking about that” “I heard….” The discussions that come from the 3 minute Week in Rap is one of the reasons I became a teacher. Another awesome feature of the Week in Rap, is that they make the past 18 years in rap for recent high school grads. I always show it at the end of the year, but I also show it at the beginning of the year and introduce the concept: what is history? My students are always impressed with how much history they lived through after watching the past 18 years in rap. It is a great beginning of the school year activity to start the discussion what is history and how we are apart of it. The Last 18 Years In Rap from Flocabulary on Vimeo. I learned about the Flow of History Website from @shawnmccusker. 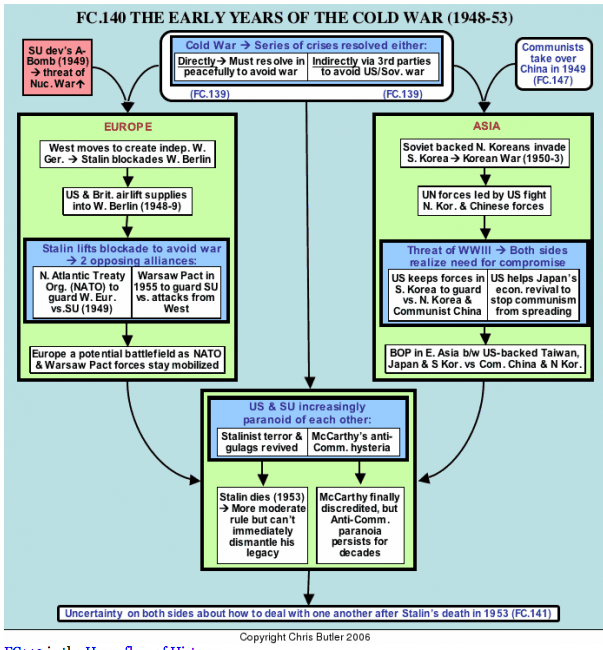 The 243 readings and flow charts organized by time period and subject, which makes it easy to navigate. 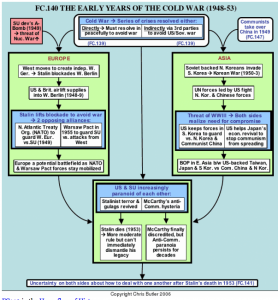 Each flow chart provides a one-page overview of a historical topic with a hyper- to the people, events, and forces that affected different periods in history. The Flow of History can be a quick reference tool for specific historical topics, the starting point for deeper research, or integrated to enhance any curriculum. According to Shawn the Flow of History is a “great site with helpful flowcharts that connect ideas in History. Great for breaking free from the textbook.” You can even get the iPad app. Share My Lesson is an interesting resource for any educator to collaborate, connect, and share with our teachers. It is a FREE website that gives teachers access to teaching resources such as worksheets, learning materials, lesson ideas, activiities, and lesson plans. The lessons are divided by grade level, subject, and unit. The website also connects teachers to an online community to build your PLC. 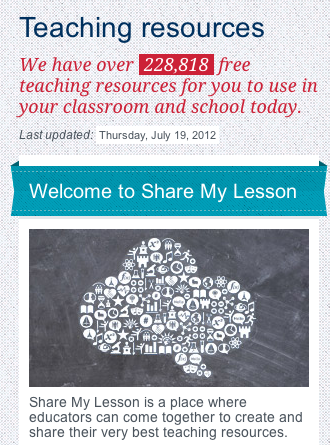 Share My Lesson was developed by the American Federation of Teachers and TES Connect, the largest network of teachers in the world. Check it out today and improve your teaching repertoire! I attended the Gilder Lehrman Institute of American History on 9/11 and American Memory. The seminar was absolutely amazing! We learned from experts about how the United States and the world have dealt with tragedy and loss with events such as the Civil War, Pearl Harbor, the Holocaust, Vietnam, and 9/11. We worked with the amazing team of 9/11 memorial experts who are involved in the planning of the 9/11 Memorial Museum, Fire Chief and 9/11 survivor Jay Jonas, and experts in the field of memory such as the seminar leader David Blight. 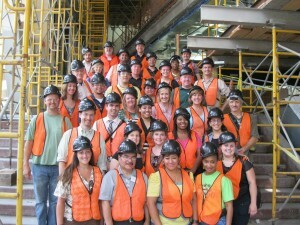 Our seminar took a personal tour of the 9/11 museum that is NOT open to the public. Even though it is still under construction, we could instantly observe the beauty, sacredness, and careful planning involved in creating the museum. I am so impressed with the planning and extensive collection the 9/11 historic site, website, and museum will offer to visitors and generations to honor the victims of September 11th, 2001. The 9/11 memorial has a wonderful collection of online resources for teachers to educate our students about September 11th, 2001. The website has an extensive collection of multimedia orientated resources such as an interactive timeline, audio, webcasts, video, images, primary documents, and essential artifacts and collections. Each lesson is tied to the Common Core Standards and based on the 9/11 collections that can be used throughout the school year and across all subjects and divided into different themes. Online Exhibitions on important topics including the Freedom Riders of the Civil Rights Movement, and Battle Lines: Letters from America’s Wars up to the First Persian Gulf War. History by Era, an online resource organized chronologically with essays by leading historians, a timeline, primary source documents for classroom use, multimedia, lesson plans, activities, and more. 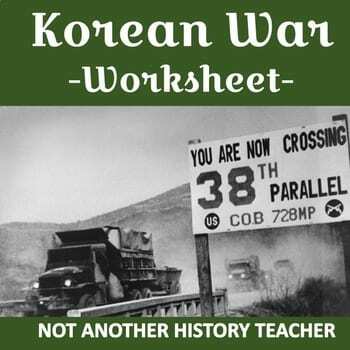 I found this project on twitter #sschat and can’t but help but rave about it. I can’t think of a better post AP United States History Exam Project. Mr. Howe’s classes created a Great Hall of Fame for American History. Here are sample projects. Awesome project! Step 1: Who do you think belongs in the top 25? Reflect on that question and type your bulleted list of individuals you think are worthy Include a sentence for each person on your list explaining how they contributed significantly to America. Do this or you won’t earn any points for the assignment! 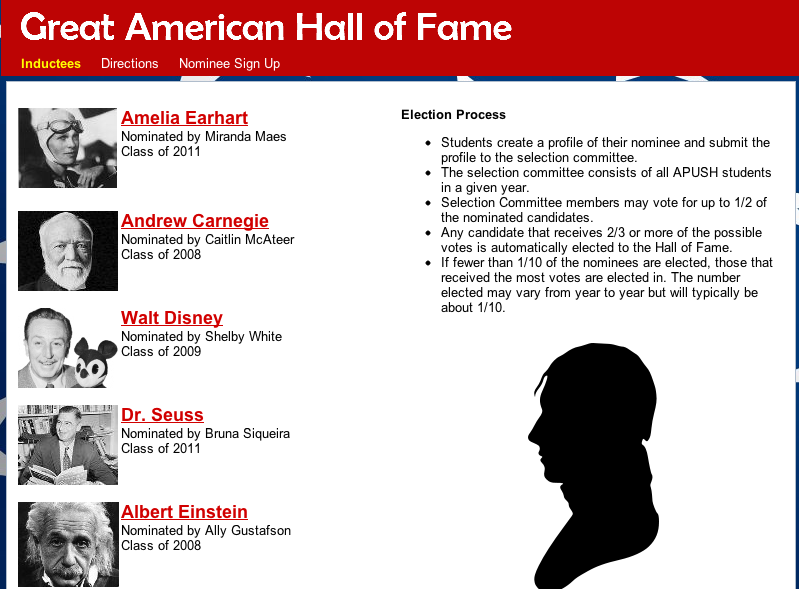 Step 2: You may select anyone from your list to nominate to the Great American Hall of Fame. Step 3: Next, research your nominee in more detail. Prepare your nominee bid and submit. 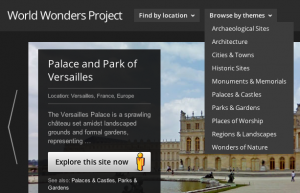 I recently discovered the Google World Wonders Project which is a website that brings historical sites online. The website is very interesting and educational because it uses Google’s Street View technology, 3D modelling, photos, videos and information to deliver an interesting medium to go on a virtual field trip. You and your students can truly explore the world from your classroom! 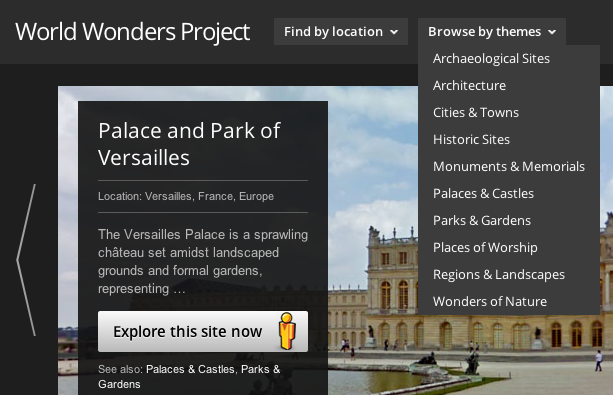 There are many interesting historical locations available to explore on the site, including the Palace of Versailles, the Historic Centre of Cordoba, Stonehenge and Hiroshima. 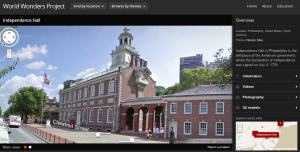 I recently explored Independence Hall and was amazed at the collection of resources: videos, google maps, images, and in depth information about the location. I can’t think of a better way to learn about history, other than actually visiting the historic site! Google also offers free, easy-to-use, and downloadable history resources which are designed in support and engage students in the study of history. The resources are clear, very well organized and FREE. I already found myself bookmarking specific historical sites to use for next school year. Check it out today! Does your class want a pen pal next year? 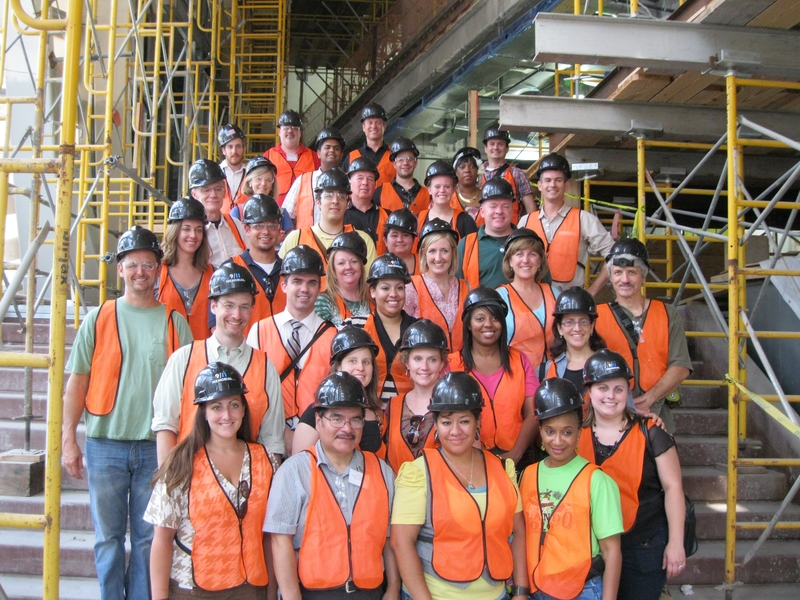 People to People International has a FREE service that connects classes and youth groups with pen pals or educational exchanges across the globe. I registered my sociology class and I am hoping it will be a great opportunity to compare cultures. It is a free program for cultural exchanges, interdisciplinary projects, and so much more. Teachers of students ages 4 to 18 are invited to participate. If selected to participate your class will receive guidance, tips for communication, and other project ideas. Classes can communicate email, snail mail, and Skype. Registration is open July – October each year. For additional information before you register, download this info sheet or submit an info request. I first learned about the Khan Academy over a year ago, but was disappointed with the lack of history resources. Over the past year the amount of resources has grown and it continues to grow. The Khan Academy is changing the face of education by providing free educational videos and lessons to anyone anywhere in the world, completely free of charge. The Khan Academy has an extensive library of videos covers K-12 math, science topics such as biology, chemistry, and physics, and even reaches into the humanities with playlists on finance and history. Each video is a ten minute long clip.